One of the most exciting new programs from the Royal Mint in London is the Queen’s Beast Collection. This 10-coin offering from one of the world’s oldest minting facilities includes new designs each year, all representative of the creatures captured in statue form during the coronation of Queen Elizabeth II. Contains 2 Troy oz of .9999 pure silver in BU condition. Face value of £5 (GBP) is fully backed by Britain’s government. 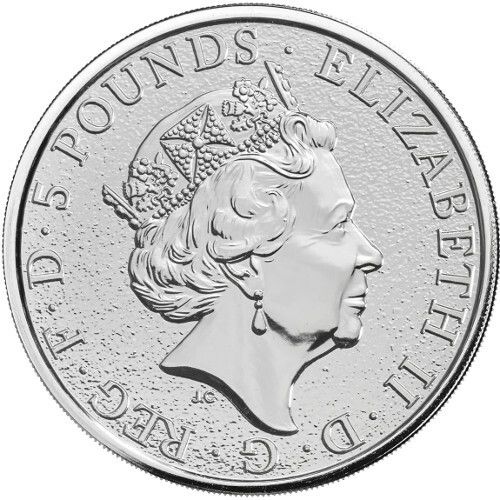 Obverse includes the image of Queen Elizabeth II. 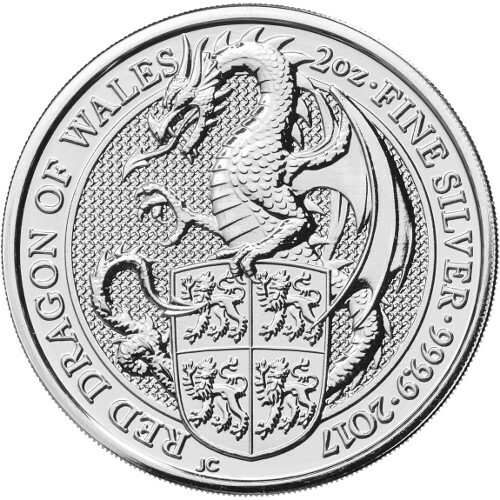 Reverse depicts the Red Dragon of Wales. The Queen’s Beast collection of silver and gold coins from the Royal Mint is slated to feature a total of 10 designs. Each new release represents one of the ten beasts carved into wooden statues that was present at Westminster Abbey during the 1953 coronation ceremony for Queen Elizabeth II. Releases in the Queen’s Beast collection to date including the Lion of England in the first release, and the Griffin of Edward III. Now, for the third release in the coveted collection you’ll find the Red Dragon of Wales on the 2017 2 oz British Silver Queen’s Beast Dragon coin. All silver coins in the Queen’s Beast collection represent the first-ever 2 oz silver bullion coins from the Royal Mint. These 2017 2 oz British Dragon Coins are available in BU condition. Coins in this condition have no signs of wear and tear, but you are bound to notice minor flaws such as breaks in the luster, spotted surfaces, and contact marks from the striking of blanks at the mint facility.